A Dream Realized: My First Under Par Round!! I saw a stat once that said less than ½ of 1% of golfers have ever shot under par. I decided just over a year ago now to really dedicate myself and go on a journey to try and join that elite group and accomplish that dream in my heart. 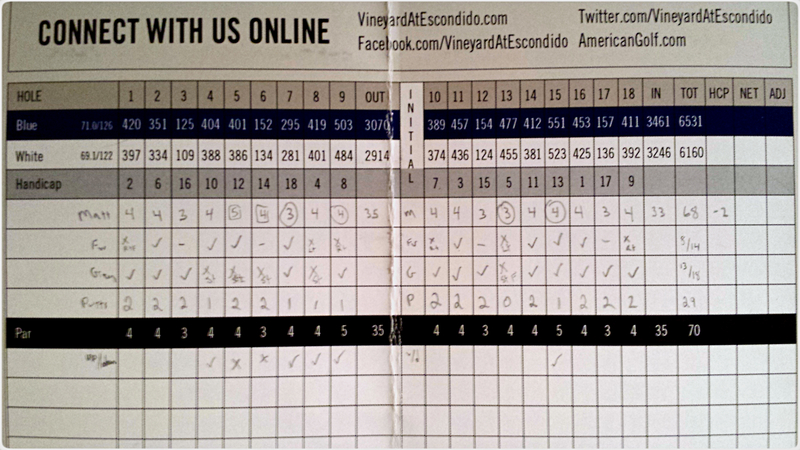 After a year of consistent practice, full of up and downs, close calls and near misses, I can now say I finally broke through and shot my first regulation under par round with a 68 (-2) at the Vineyard!! I’m so ecstatic right now guys. Hard work really does pay off and if you have any dream that you would like to accomplish, even if it seems impossible at times, just keep telling yourself everyday that “it’s possible.” Even when things are down and times are tough, just that belief that it’s possible can push you through anything. Thanks to all of you who have followed my blog over this past year and supported me in this pursuit of my dream. You guys have kept me accountable to keep working hard and to not give up on myself or my dream. Whether you have been here since day one or are just joining my journey right now, thank you for your support. This is just the first step however, there is so much more to accomplish. Next step is to shoot under in a tournament and get to the point where I am doing it consistently and get that handicap to zero or better. I look forward to pushing myself and excited for what’s to come because now I’ve seen it’s truly possible! Here is a detailed round recap of my round, haven’t done one of these for a while and I just had to for my first under par round of golf…enjoy! Awesome, Matt. Congrats! The first time is always the hardest. 8/9 GIR on the back will get it done. Keep up the good work. Congratulations, Matt! Now you can retire and take up bowling. Just kidding, of course. Here’s to many more. Congrats sir! That’s an awesome accomplishment! And thanks for liking my post on expectations this morning! I’ve read your blog for over a year now it has been a brilliant read and inspirational also. Big congrats on this accomplishment! I still play off 28 and to say I am obsessed with golf would be an understatement… I hope to follow in your footsteps one day also thank you for inspiring me. Thanks Freddy! Just keep working hard and believing in yourself and you’ll get to where you want to go…might take some time, but you’ll get there! If there is one tip I can give you that can help you start playing like a scratch golfer right now it would be on the mental side. Even if your swing is not currently at scratch or pro level, mentally you can play exactly like them right now. Make sure you create and repeat a pre-shot routine, visualize the shot you want and most importantly, acceptance of the result. Keep that positive mindset and enjoy things like trying to make an up and down after missing a green or trying to save par after a poor tee shot. Thanks for following the blog, hope you continue to stop by and I wish you best of luck on your journey! I just happened to keep looking at your blogs and I found this wonderful update that you had attained your goal! Congratulations you have further inspired me to keep making goals to reach and accomplish. I lover your strong heart that you used to keep going, even after the not so good days. You are to be admired. And I can say in honesty even though I do not know anything about golf I know my how much love a man can have for the game. My Father loved golf. I do not know if he ever shot under par because at the time he was golfing I was a self centered teenager and did not realize it was a passion of his. Since his death in 2011 I have learned more about his passions in life than I knew of when he was alive. Being able to play golf ended for him far to early due to a back injury that required surgery. Now his Grandson, who was actually named after him, has that love of golf. Congratulations on obtaining your goal. Have you set a new goal to take you further down the road to the future? Thanks for the comments and kind words J.L. I’m sorry to hear about your father…I know how difficult a loss of a parent can be as I lost my mother a couple years ago and she is the main reason why I’ve decided to start living my life to the fullest and go after my dreams because I saw just how short life can be. As far as my future goals they are to keep improving, start playing in more competitive tournaments and start winning a few of those and see where that takes me. Thank you again for your support and encouragement and I hope you accomplish all the dreams and goals you set for yourself in coming years! Wow. As someone with a handicap so bad it’s a world class physicist, this is really impressive! I hop I can put the same dedication to my endeavours. Inspiring. Just saw your blog. As someone who blogs about why some succeed where others fail, this is a great example of the journey you took to reaching your goal. Congratulations. I tell my readers that the best part of completing a journey to success is that no one can ever take it away or say you don’t deserve it. Congrats again. Now it’s on to a new goal. As I kid (12, 13, 14, 15, 16) I played at least 3 times every week. 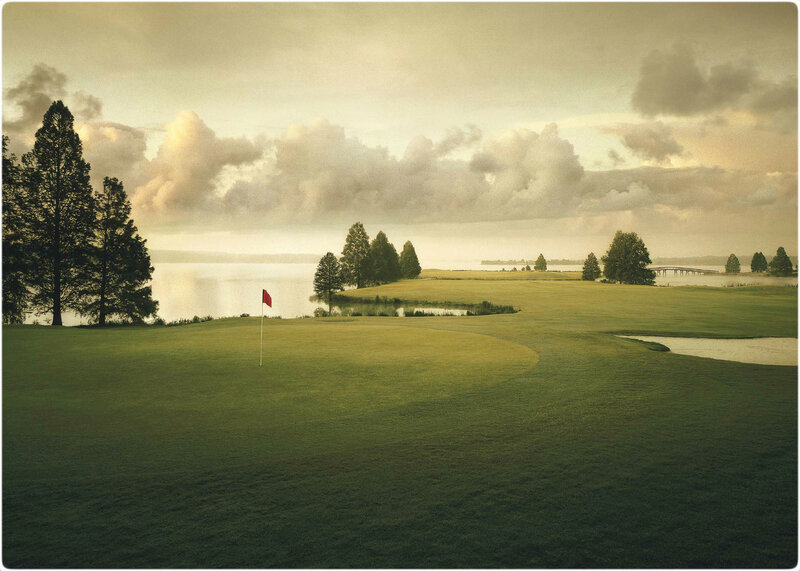 Hole number 15 was a par 3 over water… and always required a wait on the tee. The question I always had as a kid: stay focussed on the shot to the 15th, or take this pause and calculate where I stand overall.